Last night was the first night of the St. John’s Storytelling Circle for 2012. It was a great night, hosted by musician Delf Hohmann. Delf and I performed a few pieces from our new show about the Brothers Grimm, there were recitations from Storytelling Circle favourites Dave Paddon, Chris Brookes, and Hubert Furey (including a few recitations that were new to me) and a story about the Chinese New Year, from the lovely Zoe Wu. There were a lot of new faces at the Crow’s Nest, which is always great to see. I love the mix of people who come to the monthly event. Last night there was everyone from high school kids, to university students to seniors. It is the type of varied audience that I love about storytelling events in St. John’s, something which I haven’t seen at a lot of storytelling events in other places. I first met Delf Hohmann through Memorial University’s Department of Folklore, back in 1994. Ten years ago, we started collaborating on Brothers Grimm material, with a show called “Under the Juniper Tree: The Stories and Songs of the Brothers Grimm.” This year, 2012, marks the 200th anniversary of the publication of the Grimm’s first edition of their Kinder- und Hausmärchen – the famous collection of tales that would be the most translated book ever produced in the German language. To celebrate that anniversary, Delf and I have been working on a new show, and we tested out of one of our new pieces on the audience last night. The piece weaves together two stories taken from another work by the brothers, Deutsche Sagen, German Legends, which was published in two volumes in 1816 and 1818. The two stories are united by the theme of retribution, and by a cast of thousands... of rats. One of the pieces, The Pied Piper of Hamelin, is well known to North American audiences, while the other, The Mouse Tower on the Rhine, is perhaps less familiar. 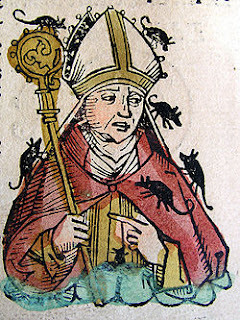 In it, the evil Bishop Hatto burns a group of hungry peasants alive, mocking them as rats that only consume food meant for their betters. The Bishop meets a rather grisly end at the teeth of rats sent as a form of divine punishment. You can read a 1910 English version of the tale here. Delf and I are off to perform our new show in February in Peterborough and Perth in Ontario, and in Wakefield, Quebec. Check out the 2wp website for details. Newfoundland audiences will get a chance to hear the show later this spring. Stay tuned!